This page relates specifically to an academic paper I wrote about using portraiture in organizational studies. It gives the figures for that paper. Figure 2: The White Cube project laid flat to show the juxtaposition of images. 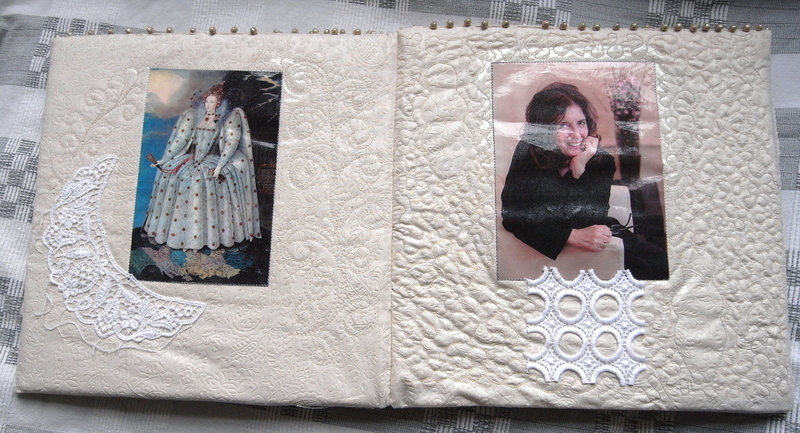 Figure 5: First panel in Anita and Me quilt. Figure 6: Anita Roddick as icon of motherhood. Below I give the final draft of the paper for anyone who is interested. The footnotes did not transfer so if you are interested you can get in touch and I will send them! This paper explores the use of portraiture as a research method in organization studies using the case example of Anita Roddick and the Body Shop International. The author makes a series of portraits in order to explore what this art practice can contribute to our understanding of both the identity of the contemporary organizational leader and the practice of organizational research itself. It explores the nature and purpose of portraiture and then goes on to work with two original sets of portraits. For the purposes of the paper Anita Roddick is compared and contrasted with Elizabeth I of England in order to give a full account of the former’s personality by juxtaposing it with the latter. The paper argues that portraiture allows us to give a fuller and rounder and more nuanced account of identity than conventional written accounts, and that it allows for a tactful criticism of public figures which is necessary for any attempt at complete and truthful biography. Keywords: visual methods, Anita Roddick, Body Shop International, portraiture, arts-based methods. I have great faith in surfaces. A good one is full of clues. Several years ago I walked into the National Portrait Gallery just off Trafalgar Square in London, and came face-to-face with a massively oversized painting of Nasser Hussain, the then captain of the English national cricket team. I laughed with recognition. The joy of recognising a living human being uncannily accurately rendered onto a flat plane covered in pigment and binder caused an involuntary embodied reaction in me. I was spontaneously and irresistibly moved by seeing the likeness of another human being, albeit one that I had never met. This paper is about using visual art. It is about Ways of Seeing to borrow the title of John Berger’s influential book, (Berger 1972). It is about how using portraiture, a visual method, can help us to ‘see’ things which might not previously have been revealed. It is not concerned with the portrait as metaphor, the pen portrait of the celebrity CEO (for a full discussion of written portraiture as a research method see Lawrence-Lightfoot, 1983, Hankmann 2002, Dixon, Chapman and Hill 2005, Chapman 2005, Harding 2005, Hill 2005, Lawrence-Lightfoot 2005; and for a critique of this method see English 2000). Neither is it about studying portraits of leaders, although excellent work has been done in this area (see for example, Guthey and Jackson 2005 , Davison 2010). The paper is concerned with the material practice of making and seeing, and interpreting physical, visual objects. It is an exploration of a visual method I have developed to (re)present research data to a wider world. In this paper I will argue that using portraiture can make two methodological contributions to organization studies research. First, using a particular bookform I made with images of Anita Roddick and Elizabeth I (which I will explain below), I argue that it is possible to say the unsayable about a research subject through juxtaposition of images and the use of montage, a technique which borrows heavily from Benjamin’s ideas in his Arcades project (Benjamin 2002). 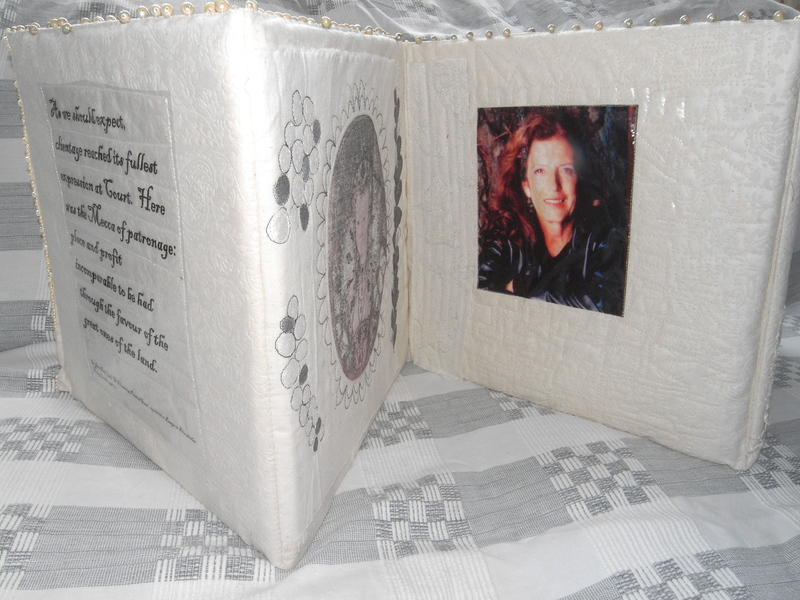 Second, using a series of portraits of Anita Roddick that I made, I argue that it is possible to say something about the fragmented, fugitive, contingent post-modern identity in a way which is not possible in conventional written research with its necessarily sequential character. The two art works which I will describe allow me to (re)present research findings in a particularly immediate way which actively engages the viewer or consumer of the research, and allows for the co-creation of knowledge. My interest in Anita Roddick and the Body Shop International began early when I encountered the organization as an impressionable teenager. I identified with the company’s values which were encapsulated in slogans such as ‘recycle, reuse, refill’, ‘Trade not Aid’ and ‘Against Animal Testing’. Later on, I came to admire Roddick’s anti-establishment ethos in her refusal to advertise her products or make false claims about what cosmetics could do. I bought and read Roddick’s book Body and Soul, and admired her energy, and commitment to ethical consumerism. Roddick, then, became a powerful role model for me, not only as a successful woman entrepreneur in Thatcherite Britain, but in moral and ethical terms. I was, therefore, delighted towards the end of the 1990s to be invited to join a Ford Foundation research team comprised of feminist scholars from the US and the UK to undertake a long-term study of gender at the Body Shop International using action research and other qualitative methods. In the event, the project lasted approximately three years and I got to know the organization well, and to meet Roddick on a number of occasions. Since revisiting this research as part of my extended study into Anita Roddick and her company I have spoken to people who worked for her, and I have encountered an interesting phenomenon which is that although she could be difficult, she did a great deal of good and won several awards and so people I interviewed did not want to tarnish her reputation or memory by being negative about her. One of my colleagues from the Ford Foundation project who continued to work for her for several years, said simply, ‘She was a flawed human being, like all of us.’ I feel a great loyalty to her across the years and do not want to write negatively about her business practices or her character (see the work of Jon Entine for a sustained critique of the Body Shop). The dilemma, here, however is that not to include the shadow side of Anita Roddick’s personality is disingenuous and gives an incomplete portrayal of her. I suspect that Roddick herself would not welcome an account of her life and work which was little other than a hagiography. There is, therefore, a tension between wanting to honour and respect her memory and giving a complete account of her as a significant figure in twentieth-century business and management history. The original artworks presented in this paper aim to make visible this tension. While I do not want to produce a dilettante art history of the portrait, I begin the paper with an account of what portraiture is, what it is for, and what it means in order to explain how I use portraiture in organization studies. For Freeland, there are three elements in a portrait: physical delineation, an indication of inner states and a subject consciously presenting itself to be conveyed in the resulting art work (Freeland 2010, 17). By the twentieth century with the invention of the camera, the idea that a portrait has to look like its sitter, the notion of verisimilitude, begins to disappear along with notions of stable, persistent personal identity. This is an idea to which we will return. Definitions of portraiture, however continue, in general to insist that an element of likeness is central. The question of likeness or mimesis, however, is important in giving the impression of contact with the actual personal. There is always a paradox inherent in portraiture, which is the question of using a two or three dimensional inert artifact to represent a living, breathing person. A portrait, then, is an intentionally made likeness of a specific person, which often intends to give psychological insight into the character, personality or identity of a sitter. This interest in the circumstances of production of portraits is relevant to theorists of organization and processes of organizing precisely because it requires organization. There is nothing spontaneous about a portrait. The photograph snapshot, one of the most common forms of portrait, for example, although seemingly candid and spontaneous, invokes a whole range of conventions and traditions. The ‘portraitist’ composes even the most candid photograph; the final image always emerges from a nexus of social relations, from organizing. West (2004) points out that producing a portrait involves repeated processes of negotiation between the commissioner and the artist and the artist and the sitter. This is true of contemporary portraiture of organizational leaders. The portrait, which has always involved more than a mimetic project in its cultural and social specificity, is a good vehicle for CEOs to convey more than what they look like. The CEO portrait, which Davison (2010) examines in official publications such as report and accounts, aims to convey more than simply a record of the CEO’s appearance. Qualities such as power, charisma, probity, authority, trustworthiness and so are also layered into the image. The production of such pictures is, then, a rhetorical act. They seek to persuade us to the suitability of this person as a leader. Davison has recourse to Bourdieu (1986) and his notion of intellectual, symbolic and social assets as discernible in portraits as a way of achieving this aim. The rhetorical impetus of image making can be seen in portraits from history (Scott 2010) of monarchs, and as Strong (1977, 1987) points out, Elizabeth I very definitely insisted on a medieval genre of portrait painting with its hieratic rather than naturalistic project in authorised royal portraits. This can be seen vividly in the contrast between the almost schematic, flat portraits of her, and the much more realistic representations of her immediate successor, James I. The primary function of portraiture according to art historians is the remembrance of significant people such as ancestors and other loved ones who have died (Brilliant 1991, West 2004, Freeland 2010). In contemporary corporate settings, however, the use of the portrait as a substitute for the real person is vital if the leader embodies the vision and values of the organization. Maintaining the presence of the leader is a key political function of portraits, and in organizational terms this can involve making present the leader across a geographically disparate organization. As soon as the organization is too large to be sited in one place, maintaining the presence of the leader such as Bill Gates or the late Steve Jobs becomes important. This was the case with Anita Roddick who was the CEO and figurehead for a global business in which she could not be physically omnipresent and whose portrait photographs came to be carefully posed and controlled as the company or ‘empire’ grew. This can be seen in a comparison between early photographs of Roddick in which she appeared striking consciously exuberant poses in her dungarees with her hair quite wild and subsequent images in which she is more groomed, with sleek hair and under artful lighting. Having considered what portraits are and what they do, it is worth spending a little time on considering why they are important, and why they continue to be made. I am particularly interested in what the way that portraiture has changed over time can tell us about our identity and what it is to be human. Woodall (1997) states, ‘The history of portraiture will be closely connected with changes in beliefs about the nature of personal identity’ (p. 9). West (2004) implies that portraits are works of art that engage with ideas of identity which, itself, is a phenomenon that can be perceived, represented and understood. She states that identity itself will be construed differently at different times and places. Identity is marked out by ideas of character, personality, social standing, relationships, profession, age and gender, and that context is vital in understanding these markers, which, she says, can only ever be suggested or evoked. Simple accounts of identity, however, have become problematic. Theorists of portraiture who trace it into the twentieth century tend to describe an upheaval in portrait painting in the light of postmodernism and post-structuralism. Once the notion of a single, stable identity is problematised, the role of the portrait in capturing Self or identity is also troubled. One response that I have available as a portraitist, which may not be open to a commissioned portraitist who has one opportunity to ‘fix’ the sitter, is that I can make a series of portraits which aim to capture something of the different identities in my chosen subject, Anita Roddick. I can attempt to show her in a number of roles, which is how I encountered her: global trader, Earth Mother, icon of empowered eighties businesswoman and so on, but I can also have recourse to the shadow side of Anita, as a capricious leader. This side emerged from interviews with her staff, and could not be recorded at the time because of political sensibilities. Now, after her death, this element of her leadership is perhaps still difficult to speak of as her legacy is there to be protected. To explore this I need recourse to hinting, as I shall explain below. Having discussed the nature and function of the portrait in Western art, I can now turn to consider my own practice using portraiture in organization studies. During my extensive field work at the Body Shop I had time to reflect on Roddick’s leadership of the company, which seemed to me to be analogous that of Elizabeth I of sixteenth-century England. The parallels between the two women and the organizations they controlled were striking. The idea of Elizabeth as a source of inspiration for business leadership is the topic of a curious book, Elizabeth I CEO: Strategic Lessons for the Leader Who Built an Empire by Alan Axelrod. This is in the tradition of the titles such as The Leadership Secrets of Attila The Hun (Roberts 2010), and makes fairly ill-informed generic comparisons between Elizabeth’s governance and the work of a modern CEO. It has, for example, chapters with titles such as ‘Queen of the Bottom Line’ and opens with the idea that it was important for Elizabeth to ‘Cherish core values’ ((Roberts 2010, 23). The anachronisms of Axelrod’s work aside, how the way Elizabeth governed can act as a lens to examine another quite different woman who lived four centuries later, as I shall go on to show. In addition, the viewer generally wants to respond. Robert Fritz (1991), in his work on creativity, suggests that we cannot bear unresolved tensions and unsolved puzzles and that this spurs us on to create solutions. As much might be said of looking at art. Viewing a picture is a relational activity and we want to communicate with the artist (Freeland, 2010). These ideas were taken up by John Berger in Ways of Seeing in which he juxtaposed images to form a kind of dialectic commentary on each other, for example, a sentimentalised painting of a street urchin next to a realist photograph of a destitute child in Victorian London. Montage, and the juxtaposition of images, credits viewers, or what might be termed consumers of research, with a great deal of knowledge, insight and creativity. It assumes that they will be able to take the hint. It also acknowledges, as Benjamin did, that meaning is immanent and that once the art work goes out into the world the maker no longer has any chance of controlling its meaning, and that although sometimes meaning is misconstrued, there are also times when the viewer ascribes levels of meaning that the maker did not and could not intend. This is both terrifying and exhilarating, and represents a generative way of working with research ‘findings’. , and as Flora, Aurora, Diana and Gloriana, Cynthia/Belphoebe, the Woman Clothed with the Sun and Astraea, (Hackett 1995, see also Yates 1975 and Strong 1977, 1987). The project, then, worked with these images of Elizabeth/Gloriana and involved the construction of a book form which can be folded to make a three-dimensional ‘room’. So that it would be free-standing I constructed the textile panels over plywood. A number of interviewees commented that the way to get on at the Body Shop, Anita’s court, was to be under thirty, male and to look good in a pair of jeans. Being invited to ‘the castle in Scotland’, one of Anita’s favourite retreats, was seen in the company as the ultimate honour and was mentioned several times in interviews. In this inner sanctum the opportunity to impress the leader was greatly improved. With my piece it is left to the viewer to make the connection between text and image, and image and image, and to draw his or her own conclusions. With regard to meaning being immanent, however, and the maker never being in full control of meaning and how the piece will be read, it seems to me, on reflection that with its white cloth, lace and pearls (which were included because of their association with Elizabeth) in its book form it looked like a wedding album. This clearly has resonance with Elizabeth as the Virgin Queen wedded to her land, people and God, but also my own persistent relationship with Anita Roddick. As a hinter myself, I had clearly not taken the hint. And so the method of hinting that I had employed had a curious antecedent in the paintings with which I had chosen to pair modern portrait photography of Anita Roddick. This accidental doubling was striking. The main point here, however, is the use of this visual method in allowing the organizational researcher to say something unsayable and still be understood by those who are able to take the hint. It does risk being an elitist method because it relies on a shared set of references and understandings, but anyone today looking at one of the great iconic portraits of Elizabeth I in the National Portrait Gallery, for example, is likely to know that something is ‘going on’ in the use of obscure props even if they cannot fully decipher them. If Fritz (1991) is right and we are susceptible to creative tension, then this is a generative way of presenting research which will involve the viewer or consumer actively in creating knowledge. This method of juxtaposition allows the viewer to see differently by making links. It insists on an active involvement with research as findings are shown not told. It sheds light on difficult occluded things for viewers who are prepared to engage with carefully selected or curated imagery, and exploits what seems to be a human tendency to solve puzzles and take hints. The White Cube project was relatively small, but the second project, I which I now describe, was considerably larger. 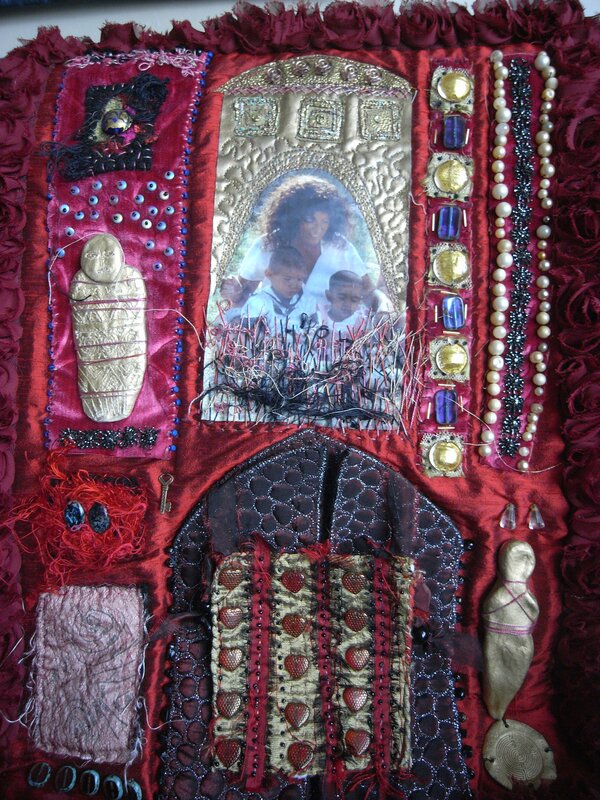 Over a period of approximately nine months I undertook to make a large and highly elaborate but improvised quilt which I subsequently entitled, Anita and Me. The next panel has a selection of the jewels and precious metals (in facsimile). It has allusions to pre-historic goddess figures, and even a soft sculpture shrine which opens to reveal a ‘relic’, a piece of felted wool roving to stand in for Anita’s trademark hair. The image on this panel, however, shows Anita as the Earth Mother, sitting surrounded by the ‘little brown babies’ of my childhood stories about missionaries in Africa. The panels were also put together in a way that was reminiscent of the use of icons, an iconostasis. An iconostasis, which is found in Orthodox churches, is a wall of icons and other religious paintings which separate the nave from the rest of the church. The intention is to produce an impressive artifact, something awe-inspiring and devotional. There is a similar impetus in my work. This is a large quilt eight feet by eight feet at its widest points. It commands attention. It also allows and invites the gaze. Silver suggests that we are licensed to look at portraits for as long as we like; we can stare with impunity. He writes that, ‘our persistent desire, our endless need, for portraiture is not just a picture ‘of’ someone we are making, it is a picture of our looking at them’ (Silver 1995, 82). Portraiture is fascinating because the subject returns our gaze. The subject knows that they will be looked at and looks right back at us, sometimes across considerable time and space. This is a quilt which demands to be looked at and rewards the gaze with new things to see on each viewing. The use of this form in an organization studies context, however, goes back to arguments made above about contemporary understandings of identity as fragmented, fractured, fleeting and fugitive. Our identities to some extent are what we perform. Kozloff sees this performative element in portraiture, ‘The performance is a mode of behavior [sic] induced or constructed and staged for the occasion of the portrait’ (Kozloff 1995, 96). What this method of presentation allows is a simultaneous presentation of a number of facets of identity, in a way that the sequential nature of academic writing cannot. The surface of the textile is broken and irregular, it is impossible to focus on the whole and the detail simultaneously. But it also allows for the presentation of a number of identities for Anita Roddick simultaneously, and in this way is well-suited to conveying post-modern and post-structuralist approaches to organization studies. It acknowledges incompleteness in its own irregular shape, but it also invites the viewer to create their own reading of identity as a text and a texture. 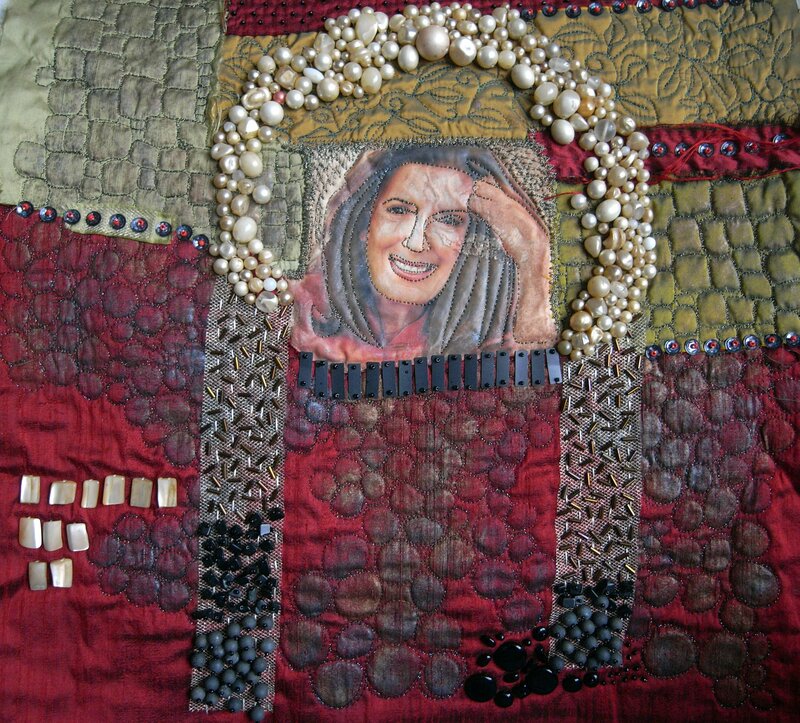 To conclude this discussion, however, I would like to return to the sixteenth century and a genre of portraiture, which has more or less disappeared but which I unconsciously drew upon during the making of my gargantuan Anita and Me quilt. This is the memorial portrait which aims to show a whole life and not just to capture a frozen moment. The best-known of these is probably the Sir Henry Unton portrait (c. 1596) in the National Portrait Gallery in London. This returns us to the idea of montage, a juxtaposition of images which the reader or viewer is invited to read and make sense of for themselves. In the case of the Unton portrait this reading is guided by the conventions of a life lived in a linear fashion: birth, maturity and death, but it still credits the viewer with the ability to work within a tradition and make sense for themselves. And it presents its subject as a multi-faceted amalgam simultaneously on its surface. As Strong shows the third dimension is time. This is not a single, all-encompassing snapshot. It suggests that knowledge about our identities and about those of our leaders is fragmented and contestable. The fact remains, tantalisingly, that a person reading Unton’s carefully constructed portrait today will, without the mentalité of the seventeenth century, see something very different from the one intended at its execution. These memorial portraits provide an interesting model for those of us concerned with identity in contemporary organizations, suggesting rich possibilities of reflecting multiplicities of identities simultaneously on a single plane. Advocates of arts-based methods (see Irwin and de Cosson 2004, Hesse-Biber and Leavy 2006, Knowles and Cole 2008, Springgay, Irwin, Leggo and Gouzouasis 2008, Leavy 2009) or, as I prefer to think of it, making art as research, claim that it allows access to different knowledge, or different ways of knowing. Worked, concrete examples of this practice, however, in my experience, are rare. In this paper I have presented two fully realised examples of art practice as research, and by working with the concrete case study of Anita Roddick and the Body Shop, I have attempted to show that there is a valid role for art practice as a research methodology in organization studies. Furthermore, as one of the basic intentions of art practice is communication, I believe that in my own textile pieces I have shown how an attention to the visual can allow us to make our investigations and to present our findings in interesting and intrinsically valuable ways. and leading to women’s independence and self-reliance. But, and this is the important point, they are also free to interpret the quilt in any way they like. As Strong says of Unton’s portrait, it never presents a single outright statement of the way the subject was, and this is as it should be in a research world framed by post-modern anxieties about the possibility of ever saying anything definitive about something as protean as human identity. Furthermore, the use of hinting allows for the possibility of giving a full picture in fragments and hints in a way that includes the negative. Every ethnography ends in a betrayal is a phrase that has been ringing in my ears as I have been working on this project. Like those I spoke to who do not want to compromise the good work that Roddick did by showing her more capricious side, I do not want to portray her in a negative light. But, as I have stated above, only to be complimentary would be dishonest. Using visual methods allows me to sidestep the betrayal. I am not necessarily advocating that organization researchers should adopt the same methods that I use, and I appreciate that there will be objections that not everyone can make art. 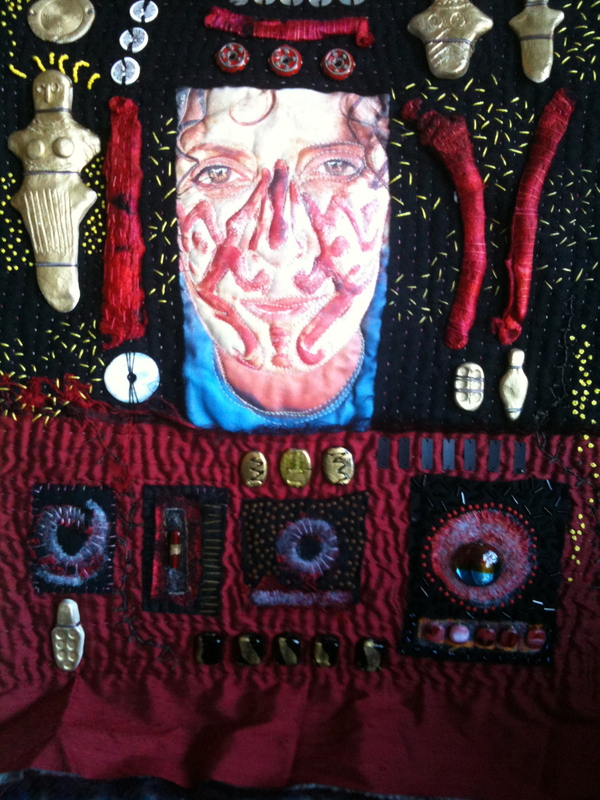 While I might dispute that position, I am not suggesting other people should make textile art. I am simply stating that those of us who do use studio practice have a particular and different contribution to make to organization studies. I would, however, also point out, that we live in an ocularcentric culture and regularly use metaphor and imagery in thinking about our work and presenting it to the world. We are also increasingly accustomed to using the visual in research (see for example, Sarah Pink’s 2001foundational work on visual ethnography) and the advent of digital imagery and attendant software for our computers, means that making rather than finding art is a resource which is open to the majority of us, particularly those interested in exploring the role of the visual in research. As Silver (1995) says, we are all portraitists now with the rise of digital photography, and this paper has aimed to show how we can incorporate this resource into our work a method which offers the possibility of as much delight as my encounter with the portrait of Nasser Hussain with which this this paper began. I am indebted to the anonymous reviewers whose comments greatly improved this paper, and also to Dr Peter Fleming at the University of the West of England whose insights into the Elizabethan court and system of patronage were foundational in my thinking. Barone, T. and Eisner, E. 2012 Arts Based Research. London: Sage. Benjamin, W. 2002 The Arcades Project. Cambridge, MA: Belknapp Press. Berger, J. 1972. Ways of Seeing. Harmondsworth: Penguin. Bourdieu, P. 1986 The Forms of Capital Trans. Richard Nice in J. G. Richardson (ed) Handbook of theory and research for the sociology of education. Westport CT: Greenwood Press: 241-258. Brilliant, R. 1991. Portraiture. London: Reaktion Books. Chapman, T. 2005. Expressions of ‘Voice’ in Portraiture. Qualitative Inquiry 11 no. 1:27-51. Davison, J. 2010. [In]visible [in]tangibles: visual portraits of the business elite. Accounting, Organizations and Society 35: 165-183. Dixon, A., Chapman, T. and Hill, D. 2005. Research as an Aesthetic Process: Extending the Portraiture Methodology. Qualitative Inquiry 11 no. 1: 16-26. English, F. 2000. A Critical Appraisal of Sara Lawrence-Lightfoot’s Portraiture as a Method of Educational Research. Educational Researcher 29 no. 7: 21-26. Entine, J. See http://www.jonentine.com/the-body-shop.html for full bibliography of Entine’s work on the Body Shop International. Freeland, C. 2010. Portraits and persons: A Philosophical Inquiry. Oxford: Oxford University Press. Gilloch, G. 2002. Walter Benjamin: Critical Constellations. Cambridge: Polity. Gittings, C. 2006. 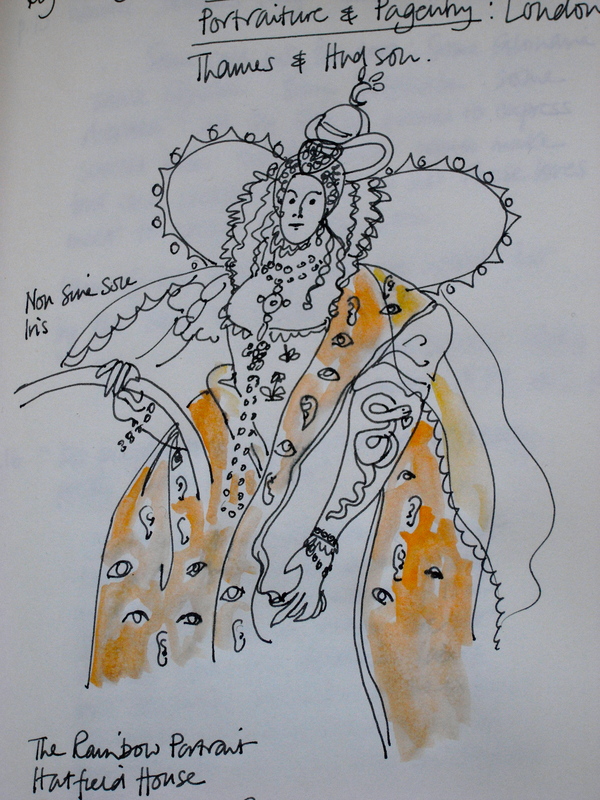 The National Portrait Gallery Book of Elizabeth I. London: Scala. Graziani, R. 1972. The ‘Rainbow Portrait’ of Queen Elizabeth and its Religious Symbolism. Journal of the Warburg and Courtauld Institutes 35: 247-259. Guthey E. and Jackson B. 2005. CEO Portraits and the Authenticity Paradox. Journal of Management Studies 12 no. 5: 1057-1082. Hackett, H. 1995. Virgin Mother, Maiden Queen: Elizabeth I and the Cult of the Virgin Mary. London: Methuen. Harding, H. 2005. City Girl: A Portrait of a Successful White Urban Teacher. Qualitative Inquiry 11 no. 1: 52-80. Hesse-Biber, S. and Leavy, P. eds 2006. Emergent methods in social research, Thousand Oaks: Sage. Hill, D. 2005 The Poetry in Portraiture: Seeing Subjects, Hearing Voices and Feeling Contexts. Qualitative Inquiry 11 no. 1: 95-105. Hockney, D. 2006. David Hockney Portraits. New Haven: Yale University Press; quoted in ‘Preface’ by Sarah Howgate. Irwin, R. and de Cosson, A. (eds)2004. A/r/tography: Rendering Self Through Arts-Based Living Inquiry, Vancouver: Pacific Educational Press. Irwin, R. 2004. Introduction: A/r/tography: A Metonymic Metissage. In eds. R. Irwin and A de Cosson27-38 A/r/tography: Rendering Self Through Arts-Based Living Inquiry, Vancouver: Pacific Educatonal Press. Irwin, R. and Springgay, S. 2008 A/r/tography as practice-based research. In eds S. Springgay, R. Irwin, C. Leggo and P. Gouzouasis. xix-xxxiii Being with A/r/tography. Rotterdam: Sense. Knowles, J. and Cole, A. eds 2008. Handbook of the arts in qualitative social science research. Thousand Oaks: Sage. Kozloff, M. 1995. Portraiture and performance, In Face Value: American Portraits, ed. D. De Salvo, 96-110. Paris/New York: Flammarion. Kramer, T. 1995. Foreword. In Face Value: American Portraits, ed. D. De Salvo, 8-9. Paris/New York: Flammarion. Leavy, P. 2009. Method Meets Art: Arts-based Research Practice. New York: The Guildford Press. Lightfoot-Lawrence, S. 1983. The Good High School: Portraits of Character and Culture. New York: Basic Books. Lightfoot-Lawrence, S. 2005. Reflections on Portraiture: A Dialogue Between Art and Science. Qualitative Inquiry 11 no. 1: 3-15. Neale, J. 1948. The Elizabethan Political Scene, reprinted in Essays in History. London, 1958: 70. Pink, S. 2001. Doing Visual Ethnography: Images, Media and Representation in Research. London: Sage. Roberts, W. 2010. The Leadership Secrets of Attila The Hun. New York: Warner, first published 1985. Roddick, A. 1991. Body and Soul. London: Ebury Press. Scott, J. 2010 The Royal Portrait: Image and Impact. London: Royal Collection Enterprises. Silver, K. 1995. In praise of the particular: American portraits. In Face Value: American Portraits, ed. D. de Salvo, 65-82. Paris/New York: Flammarion. Somerset, A. 1997. Elizabeth I. London: Phoenix. First published 1991. Springgay, S., Irwin, R., Leggo, C. and Gouzouasis, P. eds. Being with A/r/tography. Rotterdam: Sense. Strong, R. 1977. The Cult of Elizabeth: Elizabethan Portraiture and Pagentry. London: Thames and Hudson. Strong, R. 1987. 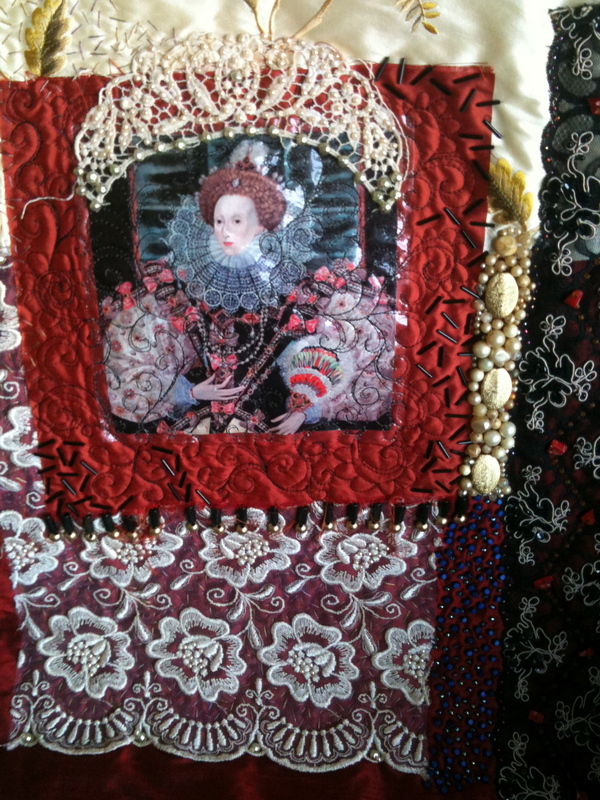 Gloriana: Portraits of Queen Elizabeth I. London: Thames and Hudson. 2nd edition. Taylor, S. 2006. My Mother, My Sweater: An Aesthetics of Action Perspective for Teaching Communication. Journal of Organizational Behavior Education 1: 57-72. West, S. 2004. Portraiture. Oxford: Oxford University Press. Williams, N. 1972. The Life and Times of Elizabeth I. London: Weidenfield and Nicolson. Woodall, J. (ed) 1997. Portraiture: Facing the Subject. Manchester: Manchester University Press. Yates, F. 1975. Astraea: the imperial theme in the sixteenth century. London: Routledge.